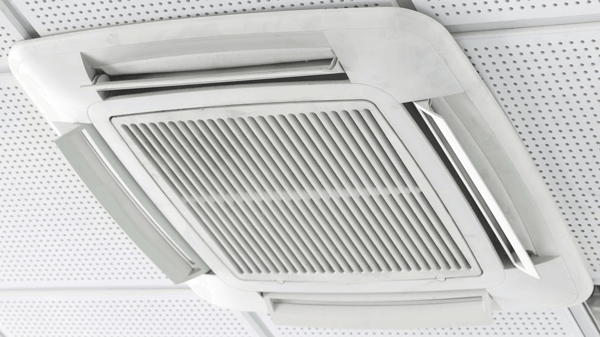 Ceiling mounted air conditioning systems are extremely popular in commercial premises. You will often find them in offices, retail stores, restaurants, hotels, health and leisure centres - and many more places too. Their popularity in the commercial sector is largely down to two main factors; practicality and effectiveness. Companies are more likely to opt for a ceiling mounted air conditioner purely because they’re more practical and effective than traditional, wall mounted, units. There are loads of benefits that come with a ceiling mounted air conditioning system in your commercial premises. Primarily, this is all down to the design of the unit. The most common type of ceiling-mounted air conditioner is a Ceiling Cassette. This is a unit that’s often installed in a false ceiling and is commonly found in offices. The main parts of the unit are all concealed within the ceiling above everyone’s heads. All the piping is hidden and connected to the condensing unit outside the building. No one can see them, and all that’s visible is the grille attachment. As a consequence, you have an incredibly aesthetically pleasing air conditioner. Aside from the visual benefits, this type of ceiling-mounted air conditioner can also help save space on your premises. You don’t have to dedicate part of a wall to an air conditioning unit, and there’s no worry of anyone banging their head on a low hanging unit from above. As you can tell, this makes the unit more practical as you don’t have to sacrifice space for comfortable room temperature. Furthermore, this type of air conditioning system is way more effective as you can install it right in the middle of the room. It can be placed above everyone in the centre of the room and has the ability to blow air in four different directions. Consequently, you get a more even spread of cool air throughout the room, controlling the temperature better than a standard wall mounted unit. This keeps the room more balanced as you don’t end up with certain areas that are way colder than others. While the design of these units may seem complicated as they have to be built into the ceiling, it’s actually very easy to install them. In fact, a ceiling mounted air conditioner has a quicker installation time than a wall mounted one. Is a ceiling mounted air conditioner right for you? Ceiling mounted air conditioners are perfect for you if your commercial property has a lack of wall space. They’re also best suited to offices, shops, restaurants, and schools. We should also stress that there are some smaller rated units that might be suitable for residential use. These units are less powerful than commercial ones, but this means there’s less noise in your home. If you’re looking for a practical and effective air conditioning system, then a ceiling mounted air conditioner is the way to go. They’re more visually appealing that wall mounted ones, take up far less space, and work more efficiently too.